Notes from the submitters, Laura and Nicola Kaftan, great-great-granddaughters of Findeisen: "William Wrede was one of the three German pastors who founded the Wisconsin Evangelical Lutheran Synod in 1850. Johannes Mühlhäuser was elected president, John Weinmann, secretary, and William Wrede, treasurer. Gottlieb Wilhelm Findeisen was acquainted with the church in 1850 and was married in Grace Lutheran Church in Milwaukee on October 10, 1852. He moved with his wife to Fond du Lac and is listed in the 1857-58 Fond du Lac city directory as a grocer. 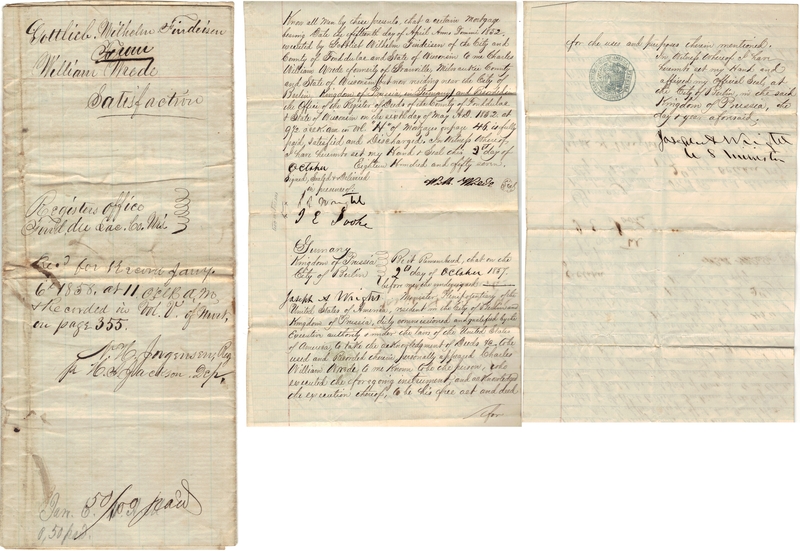 April 15, 1852 Gottlieb Findeisen borrowed money from William Wrede. He obtained a document, dated October 2, 1857, stating he satisfied this debt. William Wrede had returned to Berlin by 1857 and the document is witnessed in Berlin by Joseph Wright, United States Envoy Extraordinary and Minister Plenipotentiary to Prussia, also former governor of Indiana." 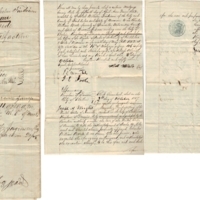 Wrede, William, “Mortgage release document from William Wrede for Gottlieb Wilhelm Findeisen,” Recollection Wisconsin, accessed April 25, 2019, http://recollectionwi.org/items/show/46.